Wireless routers with 8 ports is recommended for networks where there are more number of wired devices like desktops, servers etc. This can also be used when additional switches are not available to accommodate the wired devices. The device has 8 switch ports in addition to the WAN port. A typical 8 port wireless router is shown below. 1. 8 wired devices can be setup on the LAN. This is an added advantage as compared with a wireless router with 4 port inbuilt switch. 2. 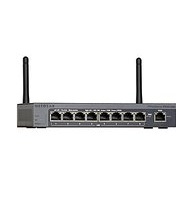 Ideal for a network which has more than 4 wired devices and less than 8. 3. Ideal for migration plans. For example, if a network currently has 3 wired device and planning to migrate into a larger network with more wired devices later, a wireless router with 8 ports can be purchased.